Guitarist, vocalist and composer Pablo Reyes is known as a very innovative and passionate musician within European and Latin American circles. 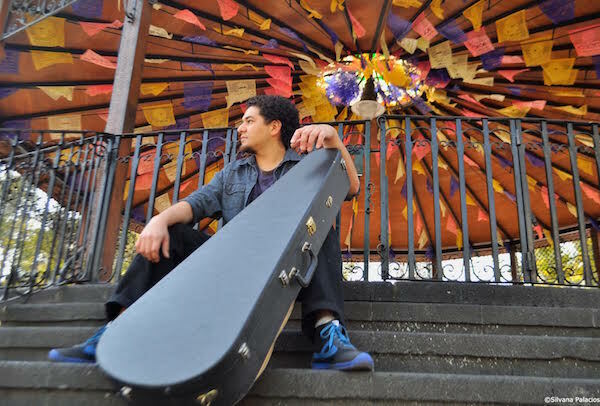 His music explores connections between Latin American Folklore, Jazz, Rock and World Music. Originally born in Mexico and partly raised in Brazil, he moved to Europe in 2008 to pursue his artistic career. After 5 years between Barcelona and Amsterdam, Reyes is currently based in NYC. He graduated from the prestigious Jazz program at the Amsterdam Conservatory and later on earned a Masters degree in World Music Studies at the CODARTS Rotterdam Conservatory. Currently based in NYC, Pablo Reyes is a songwriter that undoubtedly reveals his ‘nomadic nature’ and life experience in his musical sensibility, a strongly embedded inner urge for constant motion and experiment that creates a unique style. Reyes has released 2 albums so far, “Hojarasca” (2012) and “Molino de viento” (2013), and one EP “Rocosa Mar” (2014) under the name of MULIX, all available on iTunes. No Replies to "PABLO REYES TRIO"